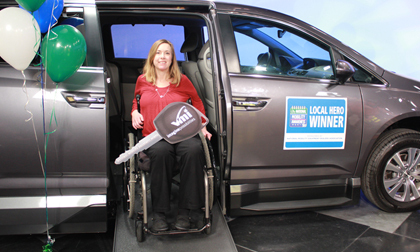 PHOENIX, Ariz. – Jan 7, 2016 – Vantage Mobility International (VMI), a leader in the manufacture and distribution of wheelchair accessible vehicles, and the National Mobility Equipment Dealers Association (NMEDA), will deliver a free 2015 Honda Odyssey with the VMI Northstarwheel chair ramp conversion to Oakland-area resident, Cynthia Noonan. The presentation will take place on Thurs., Jan., 14, 2016, at 11:15 a.m. at the Mobility Works dealership located at 1822 Embarcadero in Oakland, Calif. Noonan is a Local Heroes Winner of the 2015 National Mobility Awareness Month contest. In 2007, Cynthia Noonan was affected by the onset of Transverse Myelitis, a rare autoimmune disease that made her a C5 quadriplegic. Noonan worked at the ALS association prior to her diagnosis, which inspired her to get involved in the local community. Cynthia now serves as a board member for the Bay Area Outreach and Recreational Program where she provides sports, recreational and outdoor activities to people of all ages with all types of physical disabilities. The popular 2015 Honda Odyssey Northstar power conversion will be awarded to Noonan during a ceremony with friends, family and colleagues in attendance at local mobility dealer, Mobility Works, in Oakland, Calif. Media who are interested in attending can schedule interviews by contacting Penny Malone at 1-855-348-8267. Vantage Mobility International (VMI) is a leading manufacturer of wheelchair accessible vehicles built on Toyota, Honda, Chrysler and Dodge minivans. It has advanced the mobility industry for 30 years with a robust portfolio of power and manual ramp conversions, platform lifts and transfer seats. VMI is based in Phoenix, Arizona where its manufacturing facility utilizes Six Sigma techniques to employ continuous process improvements and deliver high quality products for personal use and commercial applications. For additional information, contact VMI at 888-348-8267 or visit http://www.vmivans.com. NMEDA is a non-profit trade association of mobility equipment dealers, driver rehabilitation specialists, and other professionals dedicated to broadening the opportunities for people with disabilities to drive or be transported in vehicles modified with mobility equipment. All members work together to improve transportation options of people with disabilities. To learn more about NMEDA you can visit them at www.nmeda.org or call them at (800) 833-0427.